The shield or seal of the Carmelite Order expresses much about the history of the Order. 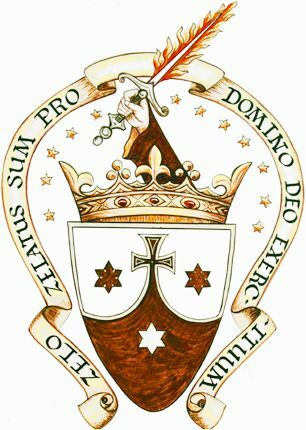 The scroll surrounding the shield is the motto of the Carmelites: “With zeal have I been zealous for the Lord God of Hosts.” These are the words of the great Prophet of Mt. Carmel, Elias, whom Carmelites call their spiritual Father. He spoke them after having challenged the 450 false prophets of Baal to a contest on Mount Carmel which proved to them that the Lord God of Israel is God alone and there is no other God before Him. (2 Kings 18) “If the Lord be God follow Him…” This zealous mission to recall Israel to the worship of the true God is also symbolized by the arm holding the fiery sword. Inside the shield is the Mount of Carmel. The Cross distinguishes this shield as being that of the Discalced Carmelites, the new branch of the illustrious Order of Carmel founded by St. Teresa of Jesus in 1562 with the foundation of the Monastery of St. Joseph in Avila, Spain. She simply wanted to repair the outrages that were being committed against the Sacred Heart of Jesus by living a life of total devotedness to Him. The star in the midst of the mountain symbolizes the prophetic age of the Order which is from St. Elias to St. John the Baptist. The star to the right of the Cross represents the Eastern era of the Carmel from St. John the Baptist to St. Berthold and the star to the left of the Cross represents the spread of Carmel to the West from St. Berthold to our own day and until the end of the world. The twelve stars above the shield signify devotion to the Mother of God to whom the Order of Carmel has always been singularly devoted. The woman of the Apocolypse with the moon beneath her feet and a crown of twelve stars on her head was the woman Our Father St. Elias saw in the foot shaped cloudlet rising out of the stormy sea. The Prophet Elias gathered together his disciples to honor the Virgin who was to bring forth the Messias and the Order which he founded was modeled upon her virtues. The virtues of the humble maiden at Nazareth as well as in the Cenacle are the virtues which the Carmelite is called to imitate in order to be of service to the Church and in the salvation of souls. The twelve stars also symbolize the twelve points of the Rule of Carmel.